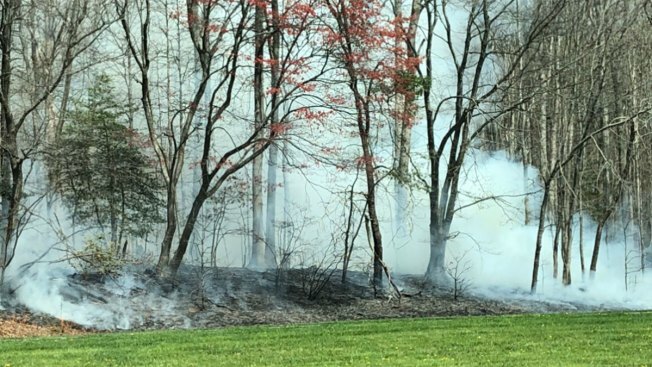 Most southbound lanes on a stretch of the Baltimore-Washington Parkway were closed for hours Sunday afternoon as firefighters from three counties battled a large brush fire. The fire was between Powder Mill Road and Route 197 in the Beltsville/Laurel area, Prince George's County Fire & EMS spokesman Mark Brady said. Prince George's County firefighters responded first, with units from Anne Arundel and Montgomery counties also called to the blaze as the fire spread rapidly, Brady said. Water tankers and multiple engine and brush units were on the scene, he said. Some units were operating in backyards on Springfield Road. All southbound lanes were closed earlier; one left lane was being reopened shortly before 11:50 a.m.
Brady said later Sunday that all lanes had reopened. Drivers were asked to move through the area slowly. Twitter user @alison_parr shared three images of the fire shortly before 12:20 p.m., tweeting at Prince George's County Fire, "When my Lyft drove by the fire that has now closed a section Baltimore-Washington Parkway, there were several different fires along the road - nice, quick response."